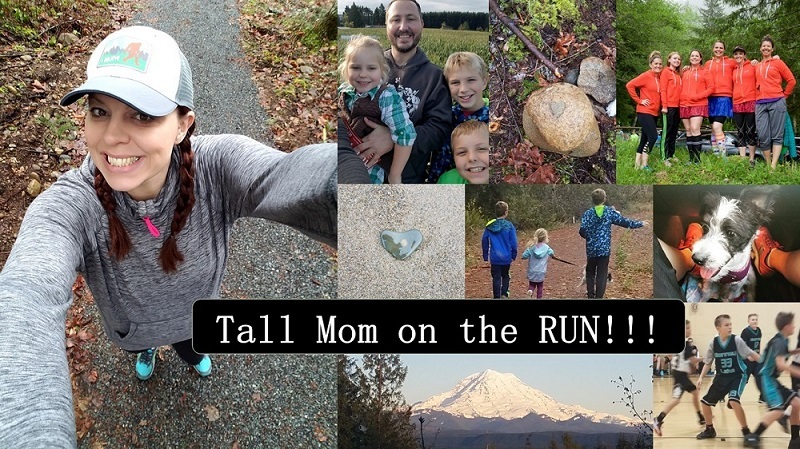 Tall Mom on the RUN: That is Ours, what is Yours? Thank you for humoring me while I retold our LOVE story :) When life gets hard it is good to get lost in amazing memories. A few people asked for pictures....well back in 2001 digital photography was not as popular, or maybe my college budget could not afford it.. 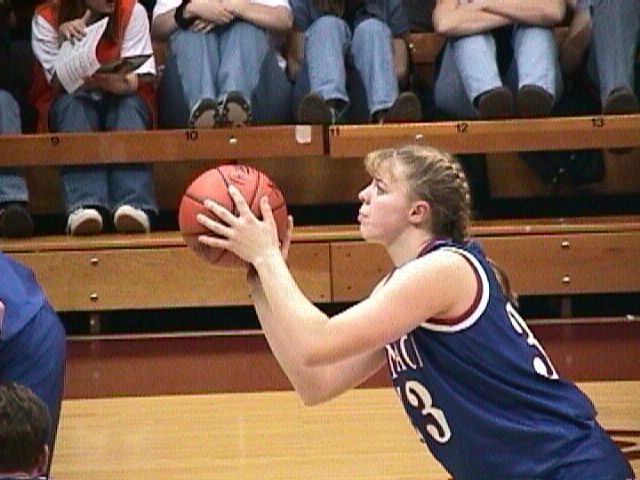 But I dug up a couple photos I had scanned..
Little Tall Mom #33 playing for Gonzaga University. I always had my hair braided and wore thick bangs.. Here is a photo from 2003 at the Puyallup Fair. Yes, I was blond for a while. I could never go back to blond, too much work. Notice how much thinner Muscle Man was, he has worked very hard to bulk up. He has an amazing metabolism. Yesterday we had a GREAT run/walk with the Little Studs. There were some dark clouds in the distance but we did not let it stop us. We ran to the track, where there was a soccer game, BUMMER! So it was off to the muddy Junior High Track. Little Stud #1 and I did a fast lap, well his fast.. Then I did a Tall Mom Fast lap.. 1:26- and I felt WINDED!!! I have a lost a lot of fitness but I am not going to beat myself up about it. Family run around the muddy bases of the Baseball field, did a few hops on the concrete to get the mud off and jog/walked home. Little Stud #1 jogged for a bit, he even pushed his brother in the jogger...SO CUTE!! When he got tired we slowed down to admire and inspect the various leaves along the path. Loved every minute. Just after we returned home the rain started to POUR BUCKETS.. Perfect Timing.. I realized that I missed an opportunity yesterday. A few people chimed in that they met their loves through Match.com.. I should have asked you all to share your story. If you have time please leave a comment or email me at tallmomontherun @ hotmail and pretty please tell me how you met the one you love. Reading your LOVE STORIES will surely make my dimples shine. Aw! I love the pictures! I met my hubby on Match.com. :) I joined kind of as a joke (my girlfriend joined too and we would go out for a night and then call each other when we got home and laugh at the people that had contacted us). She was 100% opposite from me and had a plan to keep changing her profile to see who would contact her. Tom's profile was sent to her as a suggestion after one of her "profile updates". She forwarded it to me since she thought we really had something in common. I contacted him and the rest is history! :) Maybe I'll have to write about this on my blog someday! Mike & I met online - but my parents didn't know that at first. :) We realized we knew some of the same people...and the rest is history. We're 5 years apart, and he was only my second boyfriend ever. Our relationship has always been 'easy'. We both hate drama and are entirely too rational to hold grudges or fight. In fact, we've only ever had three fights, and one of them was about the gas tax in 2004. We dated for two years, with me commuting between Tacoma & Seattle 3-4x a week. When I got into UW's Business School, we moved in together in Ballard. Two years after that, we bought the place we were renting. Two years after that, we got our little dog. It's now been seven wonderful, amazing, happy years. We'll get married at some point, but just being able to go home to my best friend is good enough for me. We really are best friends first - we can know exactly what each other is thinking most of the time, and how each other will react in a situation. I love it. My H and I met because one of our professors accused him of cheating off of me. Seriously, if it wasn't for her, I never would have even given him the time of day. Of course, all things happen for a reason. Great post idea Mel! My hubby and I met while coaching baseball and softball at Creighton University in Omaha, NE. Our offices were next door to each other and a strong friendship evolved into something more! After several years of long distance dating(he then accepted a job with Detroit Tigers to scout, then to Purdue to get back into college coaching) we tied the knot! Now, we are in the Pacific NW where he grew up...life of a coach's wife! My husband and I met on Match.com as well! My friend urged me to sign up because she thought I had a bad "picker" and thought I should have someone else pick a guy for me. She was right! Adam and I met 5 1/2 years ago after exchanging only 2 short emails through Match.com and have been married for 3 and have a 6 month old son. My husband and I were high school sweethearts, but it's not as lovey-dovey as you would imagine. I broke his heart by breaking up with him right after high school graduation (I knew that there was NO chance we would make it through college together, and needed to grow separately.) We went to schools somewhat near each other and "tortured" (as we like to say) each other with regular conact for 4 years. I dated other people, and he did the same to some extent. I got my heart broken by my current boyfriend just after graduating college. A few months later I was still kind of mopey so my mom told me we were going to the local fair one night. My husband and his father were there with a display for their ATV/snowmobile dealership and we stopped to say hello. And as I like to say, it was all downhill from there. 10 years after the reunion at the fair we are married and very happy! As you know, Hubs and I met in high school. We were in the same 10th grade math class and I totally had a crush on him because of his english accent. He was friends with a friend of mine so I roped my way into joining their group one Friday night... he wanted to be friends, until I ended up dating another one of his friends. :) I still had a thing for Mark so it didn't last long with the other guy. And here we are. I can't believe I was only 16 at the time! Another online dating love story here! I was almost a year post-divorce, living by myself, working second shift at a big postal processing facility. Working until 12:30-2:30 a.m. does NOT do a girl's social life any favors. The only place you can meet people with that schedule is at bars, and let's just say been there, done that. So one night I was checking my email and I had a coupon code for a free month. I signed up and met a few interesting people and went on a few interesting dates. First dates only. Never a second date. Then I met D. He IM'd me one night while we were both online. Before I even responded to the IM I pulled up his profile to see his pic. It was a candid shot of him with his shirt off. Let's just say I love a man with abs. lol I was all, "How YOU doin'???" So we chatted for a few, then he called and we talked all night that night. Literally. ALL NIGHT. That was on a Friday night. I had to work over because it was tax day, April 15th, a VERY HEAVY day for the post office. And he had just gotten back from Atlanta from picking up a car at auction. So we both just happened to be up and online at 2:00 or so that night. Anyway, we talked that night, and I had to work Saturday night too, but we talked ALL NIGHT that night, too. Then finally Sunday we got to meet for our first date. :) That was in April of '05. We just dated until the next January, then I moved in with him, and then we got married in May of '07. I met Ken in the backseat of a car. Sounds worse than it is. It was love at first sight and here we are married 15 years later. Met my hubbs at work. I was in a dry spell so to speak and he was the only normal guy around me for a while! LOL! He says I chased him, but I think it was mutual. 10 years later, 7 years of marriage and we're still as happy as can be. Marriage and relationships take a lot of work, but when it's with the right person, it never feels like work. First of all, love those old school pictures. Have to say, I prefer you as a brunette. I think you know this already, but J and I met when I was 17 on a recruiting trip to Cornell. He took me to class with him and on a tour of the campus. We didn't talk after that for over 2.5 years. Then on the second day of a joint track team trip to England, we had one of those "time stands still" moments and I have loved him ever since. It's been easy from day one and I am so grateful for that. My fiance and I were introduced by a gal I worked with. He and I were both going through custody battles with our kids at the same time. At first, we just chatted online, giving each other advise. Then we started liking each other.. Then I found myself without a computer and he showed up with a spare and set it up for me and baked me some pot-pies. 4 years later, he proposed and I'm now planning our wedding! Great post with some great photos! Love it! 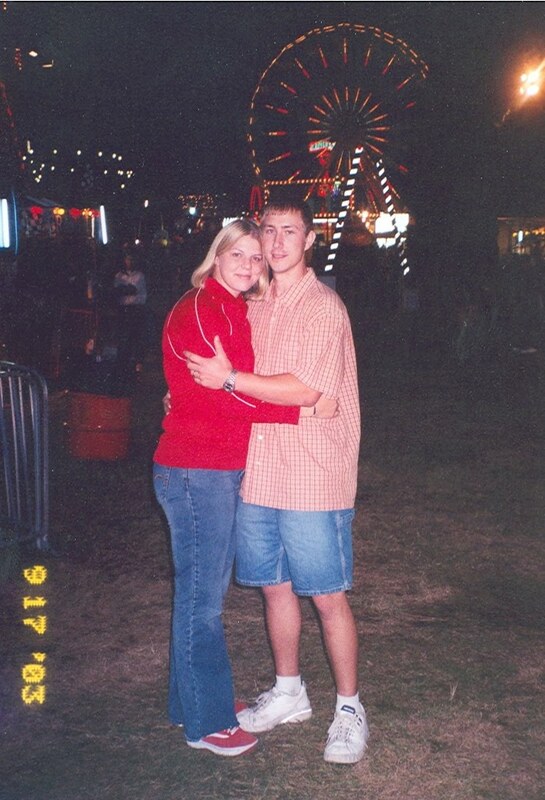 Met my sweet hubs my junior year in high school. He became my best friend and after he set me up with his best friend and it didn't work, God changed our eyes for each other and we've been together ever since! I was going to share another date we have in common, but I got so wrapped up reading your story I forgot to comment. November 7th is my hubby and I's wedding anniversary so we were celebrating love yesterday too. He told me he loved me after a month at Halloween, I waited (even though I knew then) until Christmas. I could have married him then - and would have if he'd actually had to move away - but we waited 4 years. Married in 2003 and had our son in 2007.
i LOVED ready your love story yesterday! my husband & i met a year or two before we started dating --- i worked at a restaurant with his best friend and that's how we met. one day i mentioned to the friend that he should bring my husband around more and then one day he asked me out to dinner! the rest is history! My husband grew up in the same town and always knew who the other was; it is a small town! He went to the cross town high school and was a couple years older than me but he was great friends with my brother. My brother and I did not grow up together; he was raised by our grandmother. When my grandmother (nanny) passed away my brother came into town from the Navy and I came into town from college. Neither one of us had a car so his friend Scott drove us around all weekend. The weekend ended with Scott sneaking and asking for my phone number. We dated for a few months before Scott had to tell his best friend he was dating his baby sister! 10 years later here where we are! Oh the old bball pictures. I have the oodles of them from college bball. 2 family members and 2 friends found their soul mates on match.com! Love it. My husband and I met in college. He asked me to go to a college dance, the rest is history---our first date was November 13th---12 years ago. Now almost 9 years married and I couldn't be more blessed to married to such an incredible man. Love this! I didn't recognize you with blond hair! The hubs and I met when we were 19 in our first year of University. We lived on the same floor of residence. The first weekend at school, everyone went home so there were about 10 of us on our floor that went out to a bar. The football game was on and the hubs and I were chatting and said it might be fun to go the next day to a game...which we did but I thought it was just as friends. I was wrong..and we've been married 16 years. great pictures! thanks for sharing!! Hi Mel! First time commenter, but love sharing the story of how I met my husband: Two years ago, I was living in Anchorage, AK doing local community theater. My husband had seen me in several productions, but never had the nerve to ask me out. He came to see a show that a friend of his was in, and there I was. So the next day, I was enjoying the sunshine outside the theater, and this guy walks across the street making eye contact with me. Now keep in mind that this theater is not in the best part of town - in fact, not a week earlier I had a fellow roll up in a huge pickup truck and offer me money to come with him! So immediately I am on high creep alert! But he tells me he knows my friend, that he's seen me in all these shows and would love to take me to coffee some time. We meet up at a shop (one that a friend of mine works at - girl can't be too careful!) and hit it off right away. Two weeks into the relationship, he tells me that he is leaving the state for good in less than 6 months, and we decide to go together. Just over a year after the first date, we were married, and I am forever in wonder that I get to spend my life with my best friend and soul mate. Keep up the good work! 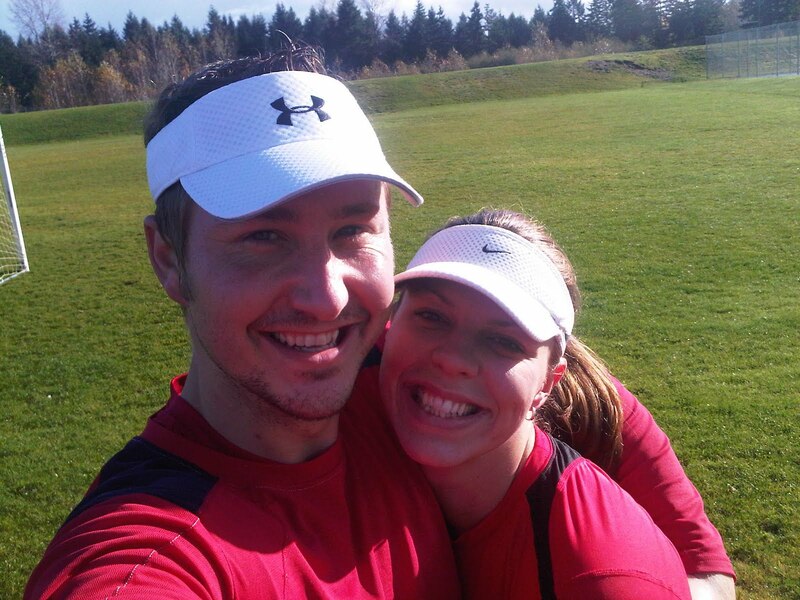 I'm a runner just starting to train for my first marathon and I stumbled upon your blog. It's truly been an inspiration for me! How fitting to show a basketball pic right at the beginning of basketball season! Love it (had to show Ali too!) Here's to girls that grow up to be 6' tall. Fingers crossed! Nice job at the track! My hubs and I met during our freshman year of high school, on a bus. My best friend and I had been recruited from the choir to hold the banner in front of the marching band for a competition they were participating in. Jacob was a drummer, and wound up sitting in front of us. He turned around to say hi and I said, "hi, do you think these sunglasses make me look stupid?" According to him, love at first sight. Not so much for me, who once turned down a request to be his girlfriend by responding that I really was hoping Josh would ask me out. Poor guy. Less than a year later we were "official" (1998) and in 2003 we got married. We now are the proud parents of two beautiful kids. Whoever imagined? Great post, Mel. I enjoyed reading everyone else's love stories! My husband and I met on Match.com. Four months before, I had gotten out of a two-year relationship. At that point, I was done playing games. I wrote my profile almost in a defiant way...I spelled out exactly what I wanted and didn't want...and if people didn't like it, they shouldn't contact me! I guess my husband wasn't put off by my directness because he wrote to me. We spent a week emailing, a week talking for HOURS on end on the phone, and then we met. We were engaged three months later, and married 13 months after meeting. I knew he was the one because he is as crazy about his family as I am about mine. Also, our first date was to the very long Easter Vigil at the Catholic Church, and my dad went along with us. Any man who is willing to go on a first date with a girl's dad tagging along is a keeper!